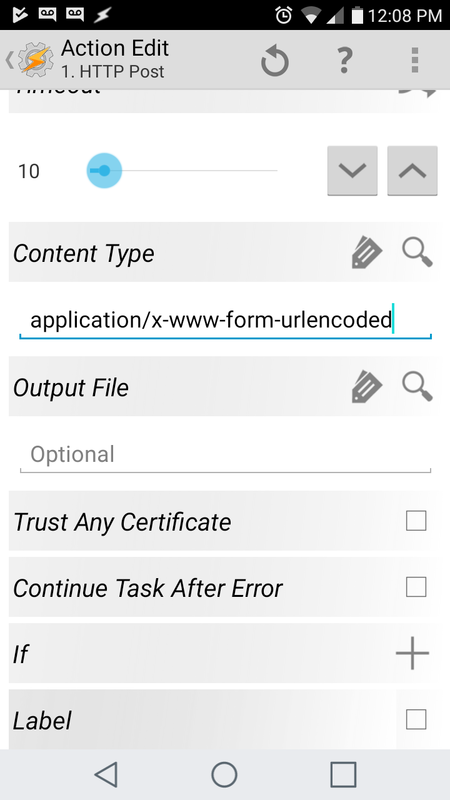 Tasker is an application for Android which performs tasks (sets of actions) based on contexts (application, time, date, location, event, gesture) in user-defined profiles or in clickable or timer home screen widgets. 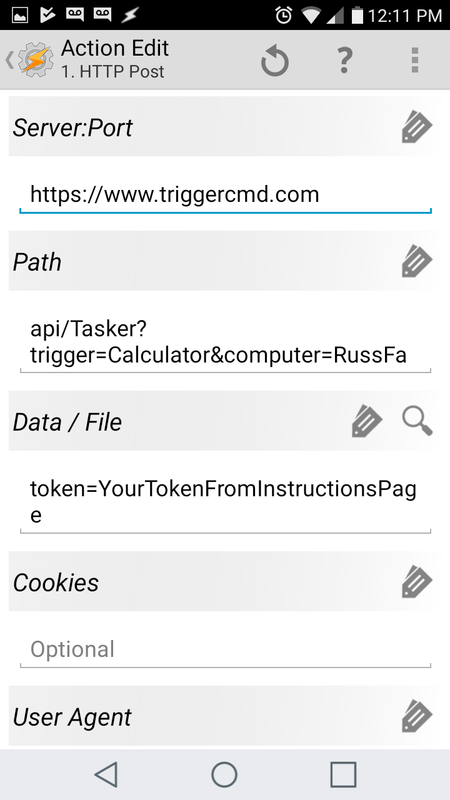 In Tasker, under the Tasks tab, tap the + button to add a Task, then give it a name like "Playlist on Family"
Tap the + button in the Task Edit screen to add an Action to your task. Select "Net", then "HTTP Post", then configure them as these screenshots show. Make sure you don't have a carriage return between "token=" and your token from the Instructions page. I made that mistake and it took a while to figure out what I'd done wrong. I emailed my token to myself so I could copy/paste it on my Android. Tasker lets you export an action as an Android app, so now I can tap an icon on my Android desktop that opens my garage. That's pretty sweet. EDIT 9/4/17: Now you can add &params=(your command parameters) to your Path or your Data/File field to pass Tasker variables as command parameters. You have to enable parameters on your commands first.